West Ham United to bid for Olivier Giroud? West Ham in for Giroud? West Ham United have reportedly emerged as fresh candidates to prise away Olivier Giroud from Chelsea before the closure of the winter transfer window. The Frenchman has endured a tough season with the Blues with the solitary league goal and he is currently warming the bench with winter recruit Gonzalo Higuain preferred ahead of him upfront. According to The Mail, the Hammers are looking into a probable deal for Giroud before the transfer deadline amid their recent struggles in the striking department. Marko Arnautovic has returned to the mix after sorting out the uncertainty regarding his future but the east London side are still keen on reinforcements before the end of the month. Maxi Gomez looks set to join the Hammers in a club-record deal from Celta Vigo in the next 24 hours but the Capital outfit are still rumoured to be weighing up a move for Giroud. 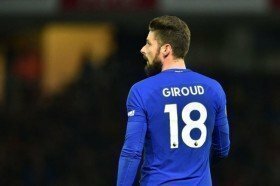 Giroud, who has just six months remaining on his Chelsea deal, has recently indicated that he would like to prolong his career in the Premier League, should he make way from the Blues.